Breathe, people. Relax. Valve isn't holding a press conference today. And despite all the speculation you might have seen on social media or other gaming websites, they don't have some big GDC announcement planned for 3'0'clock this afternoon—3pm on 3/3—so please, don't get your hopes up. The speculation started in earnest yesterday with this BBC article, which incorrectly claimed: "Valve is expected to provide more details about the [VR headset] launch at its own presentation at the Game Developers Conference (GDC) in San Francisco on Tuesday." The running theory: Valve has something big to announce at their press conference today. The problem with that theory: Valve isn't actually holding a press conference today. The actual truth: Sergiy Migdalskiy, an engineer at Valve, is holding a GDC presentation on physics optimization strategies for game programmers today at 3pm. There is no press conference, nor are we expecting any surprise Half-Life 3 announcements there. To quote the presentation: "Topics include numerical integration, contact manifolds, destruction, solvers, networking, and optimization." But you don't have to take my word for it. I asked Valve marketing boss Doug Lombardi this morning if there was some secret presser that Kotaku wasn't invited to. "Big mix up," he told me. The takeaway, as always? 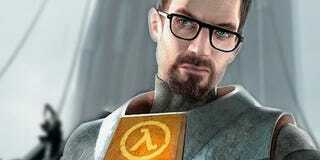 Half-Life 3 is never coming out.